Stocks are down sharply in the past two days. I look at three possible reasons why. One story is happy: Maybe faster business expansion and more competition for workers will hurt corporate profits but lead to better deals for workers and customers. Maybe investors are worried that central banks will raise interest rates. Most worryingly: Maybe higher budget deficits mean we’ll need higher interest rates, regardless of what central bankers are thinking. So, why are stocks down 1,700 points in two trading days? Nobody really knows, but it’s always fun to guess. I see three big stories out there, with very different implications for the real economy. Here they are, in order from most to least optimistic. 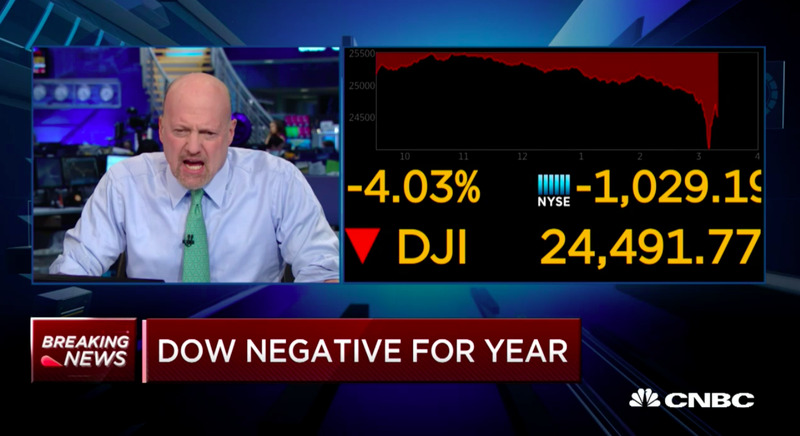 CNBCCNBC’s Jim Cramer winced near the end of the trading day on February 5, 2018. 1. Stocks are down because faster business expansion and wage growth will push down profit margins. 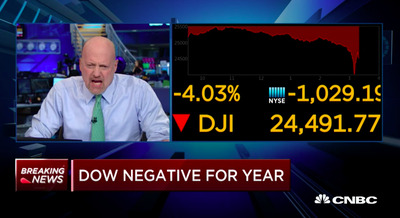 Under this theory, stocks are falling because the economy is good. This is the most optimistic story, and Bloomberg’s Joe Weisenthal suggests President Donald Trump should embrace it. Here’s the claim: Because the economy is improving, firms are going to expand, and with higher capacity, they’re going to have to cut prices to get enough customers. And they’re going to have to pay higher wages to get the workers they will need to handle that expansion. All that competition for workers and customers is going to mean lower prices, higher wages, and lower corporate profit margins, so stocks are down. It’s a happy story about the broader economy. But is it true? If so, it would be a reversal of a key economic story of the past nine years of recovery: As the economy rebounded, firms were conservative about expansion, preferring to enjoy high profit margins rather than to expand in search of more market share. The most obvious data point in favour of the workers-up-owners-down story is Friday’s jobs report, which came out right before the two-day stock bloodbath and showed wage growth up to 2.9%, the highest since 2009. Maybe firms finally are so eager to expand they’re willing to pay higher wages, and maybe that’s what terrifies the markets. Another hint of this story came a couple of weeks ago: United Airlines announced it would expand capacity, which led to tanking stocks across the airline sector out of fear of price wars. As an airline customer, you like price wars. As a shareholder, you do not. 2. Stocks are down because improving economic data will lead central banks around the world to raise interest rates. As wage growth accelerates, central bankers are likely to become nervous about inflation. Or, they might just feel the opportunity has arisen to “normalize” rates, which will give them room to cut them again if the economy starts to soften. Either way, it means the bankers will react to good economic news by hiking rates. Those higher interest rates will make it more expensive for companies to invest and grow. Higher interest rates may also make stocks a less appealing asset on a risk-adjusted basis; why hold a stock with an expected annual yield of 8% when yields on safer bonds have gone up from 4% to 6%? For investors to continue to find stocks appealing in the higher-interest-rate environment, the price-earnings ratio will have to be lower, which is to say the stock price will have to fall. This seems to be the most popular story of what the markets are doing, and the 10-year Treasury bond yield has indeed been rising for the last month. But there’s at least one obvious question that arises with this reasoning: For most of the last month, as those yields were rising, stock prices were also rising. What changed in the past few days? Also, discussion of this story sometimes seems to assume central-bank actions are arbitrary. But what if there are good reasons that interest rates have to go up? That leads me to the third story. 3. Stocks are down because competition for scarce capital will lead to higher interest rates. The Tax Cuts and Jobs Act was a strange piece of pro-cyclical economic legislation: Near the top of the economic cycle, the US government enacted a large, deficit-financed tax cut. This year, the federal government will need to borrow $US1 trillion to meet its obligations, in large part because of this law. We’ve gone through a strange 20-year period where it’s mattered very little how much money the US government borrows. Demand for government bonds has been endless, and very low interest rates have coexisted with very high budget deficits. There has recently been little to no economic blowback from government borrowing. But back in the dark ages, politicians used to spend a lot of time talking and worrying about the link between government borrowing, interest rates, and private investment. If you look at a transcript of the first 1992 presidential debate, there’s a lot of worry and argument about the link between deficits and interest rates. And both George H.W. Bush and Bill Clinton signed major budget packages with the key goal of shrinking the federal budget deficit and allowing long-term interest rates to decline. They had some success, too. What if we’re back in that world, where the tax cut is pumping money into the economy but also forcing the federal government to borrow hundreds of billions of extra dollars, at the same time that there is finally an increasing impulse for business investment? The government and expanding companies are bidding against each other for a limited pool of capital. That should make investors choosy, and should lead to higher interest rates and lower price-earnings ratios. To put that another way: In this setting, stock prices should fall, bond yields should rise, and the cost of investment capital should increase. That higher cost of capital will discourage investment, just at the same time that lower tax rates and perhaps an improved outlook for growth are encouraging it. The tax cut will undermine its own benefits, as increased government borrowing drives up interest rates. Economists would have told you that effect was going to show up in the long run, which is why economic models of the tax bill tended to show more negative results the farther into the future you looked, as increased government debt had a negative effect on the economy. But the less slack that exists in the economy to begin with, the faster the effects of higher government borrowing should be seen. This, obviously, is the most negative of the three stories. So, which story is right? I don’t know. Probably all three, in some combination.